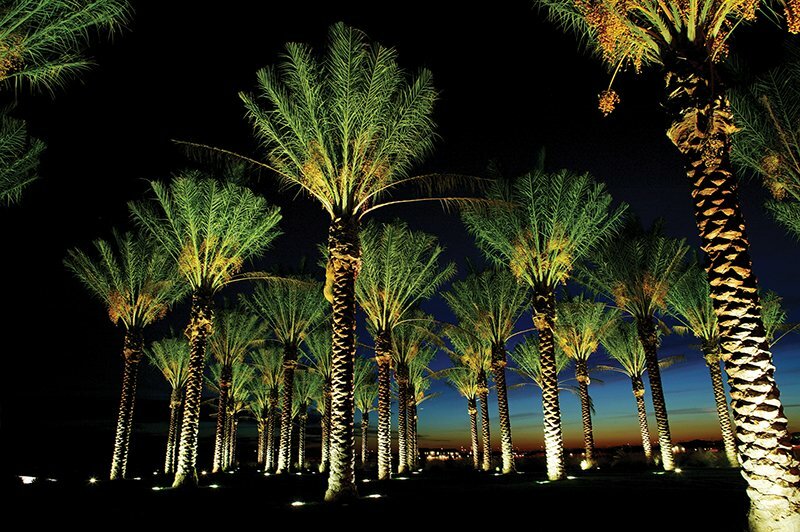 Palm trees lend themselves to dramatic lighting treatments. Photos courtesy of Vista Pro. An element of imagination, of whimsy, of love of nature can inspire homeowners to add spotlights to their residential landscapes. “The whole idea of lighting is to bounce off something, find the focus,” said Rene Weston, owner of Executive Landscaping Inc. in Pensacola. What is the best outside feature of your home’s outdoor spaces? Is it the trio of palms near the front door or the canal out back? What features would you most like to showcase? ▪ Provide a moonlight effect when lights are mounted high in trees and shine down. The house color, setting and type of landscaping all play a part in the best design. Spotlighting your landscape can be year-round, weekly or seasonal. “Evergreens are striking with blue lights that embolden the green,” said Jeff Dross, corporate director of education and industry trends at Kichler, a Cleveland, Ohio-based leader in indoor and outdoor lighting. Different sizes of beams and types of lighting can be used to great effect. Weston prefers a narrow beam to highlight crepe myrtles and a broader beam for oaks. Cross-lighting from the right and left provides dimensionality and depth. One fixture can illuminate several focal points in multiple directions. Safety, too, is a consideration. Make sure paths and deck stairs are well-lighted. Most path or spread lights are 18 or 24 inches tall and best placed at intersections of pathways and at the top and base of stairs. You don’t want to trip over the light fixtures or have the lawn mower run over them. ▪ An irrigation expert who also does light installation. Whomever you hire should have a plan or design and should look at your property at night, as well as get the view from inside the house and from the street or sidewalk. “We take a variety of lights to houses at night so homeowners can see what they like,” Weston said. Spotlighting not only lets you highlight desirable features but it also helps you downplay less desirable features, drawing your eye away from the neighbor’s garage, for example. If your living room window overlooks three acres of woods, spotlights can enhance the scenery, Dross said. Home supply stores have low-voltage LED lights of varying sizes to illuminate small narrow trees. For larger jobs, Dross and Weston both recommend hiring professionals, given the components, ladders, wires, cables, controllers and installation know-how that would be involved.